We serve over 1,600 children each year… from 41 birth countries and 46 states! Your family will be joining a diverse, connected, and vibrant adoption community when you register for our Heritage Camps or Domestic Adoption Camp (or both!). Reserve your family’s spot at camp! Many camps fill up quickly, so be sure to register your family for 4 days this summer, and know that it will make an impact for life. We are so excited to enter into another camp season, with outstanding programming designed to build relationships, have fun, and learn about adoption and culture! Click here for a full list of camp dates, locations, and registration openings and deadlines. Thank you for donating — making camp inclusive for all adoptive families! 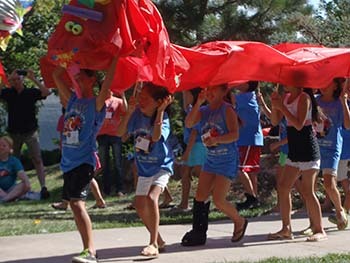 Our camp fees are considerably lower than many other adoption camps. We believe it’s important to be inclusive, and want to ensure that camp is affordable for the majority of families. Your tax-deductible donation at registration helps us provide scholarships for camp fees and accommodation for those who qualify for financial support. Thank you for your large and small donations that you add on to your registration fees! Each year, we must raise $250,000 outside of camp registration fees. Invite friends in your adoption community! Word of mouth is by far our best marketing tool. Refer a family to HCAF; through our +ONE program we’ll thank you with a $25 Camp Market certificate for every new family you refer to any HCAF camp, not only the one(s) you attend. For four new family referrals, in one year, receive a $100 gift certificate to the Market or one free registration! Just have the family you refer list your name when they register for camp. Your market certificate(s) will be waiting for you at your camp this summer! Contact us if you refer four families who come to camp to let us know which reward you prefer.